​The Junior League of McAllen has hosted Fashion for a Cause, its fashion show fundraiser, for three years. All funds raised benefit the various community programs that JLM organizes over the year. 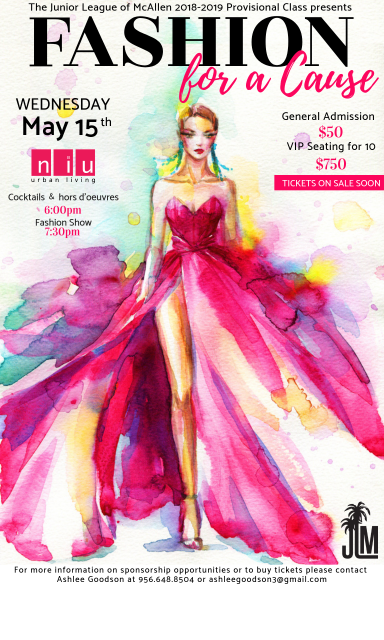 This year the fashion show will be held at NIU Urban Living, for the third time, on Wednesday, May 15, 2019. Preceding the show will be a cocktail hour where all attendees will be able to enjoy cocktails, hors d'oeuvres and mingle. Support the Junior League of McAllen by purchasing a General Admission Ticket. If you are interested in a sponsorship, please complete the form below and a League member will contact you. Note: A 2.83% service charge has been added to the General Admission ticket. This fee will help offset processing fees JLM is charged for online transactions. JUNIOR LEAGUE OF McALLEN, INC.